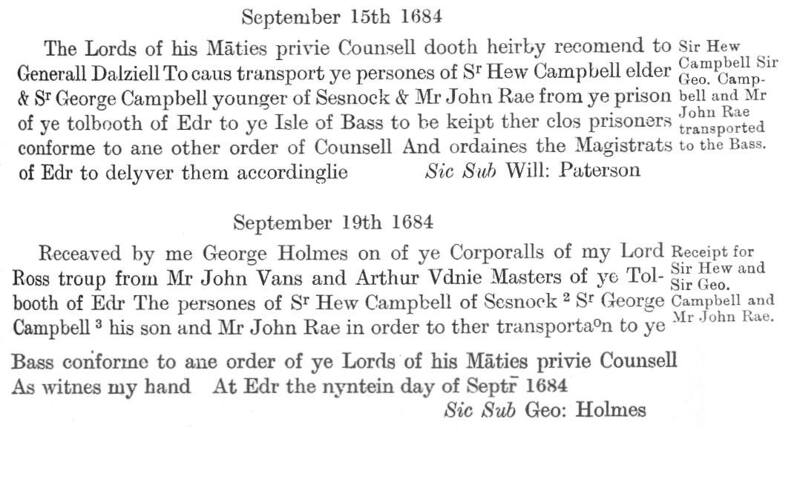 The vagaries of the Privy Council included attempts to ruin and hang (if possible) members of several prominent families including Gordon of Earlston and Sir Hugh Campbell, the Laird of Cessnock. Both families were of Lollard sympathies and their ancestors had been friends of Alesius and other Reformers. With this background they had a high profile that suited the aims of the Privy Council and its grasping members. Making an example of Cessnock would act as a warning to others and, importantly, would fill their pockets. Cessnock was imprisoned after the battle of Rullion Green (November 1666) – to keep him out of the way, and subsequently he was not complicit in any actions by the Covenanters. He remained sympathetic to the Presbyterian cause, however, and his home at Galton was a region where the hunted men lurked. On a number of occasions he showed his oppressors his support for the regime by chasing Covenanters from out of his barony, and by regularly attending Galston Church. But this was not enough for the Lord Advocate, Sir George Mackenzie of Rosehaugh. The pursuit of Cessnock arose through a boast made by Mackenzie in the presence of the king, that he could bring a charge of treason against him and, by the by, promised his lands to an illegitimate son of the king – this before any charges made or trial had taken place. The trial began on 24 March 1667 with another eminent lawyer, Sir George Lockhart, assisting Mackenzie in the prosecution. Cessnock had a team of nine counsel including Sir Patrick Hume and Sir John Lauder of Fountainhall. Lengthy legal debates followed before the charges resolved to one in particular, that Cessnock incited rebellion. It was alleged that he had spoken to survivors of Bothwell Brig and had chid them (reproved them) for cowardice. In support of the allegation the Cown produced two witness – Ingram and Crawfurd. Before they gave evidence, however, Cessnock spoke against them – telling Ingram to be careful and not damn his soul by lying “for as I shall answer to God, I never saw you nor spoke to you before.” Ingram was so shocked by the bald statement that he resiled from his witness statement. The court erupted with clapping and cheering by Cessnock`s supporters who were present, and the jury refused to be browbeaten by Lord Perth, the Justice General. Crawfurd also declined to confirm his statement and amid considerable rejoicing the jury acquitted Cessnock. But this was not good enough for the Court, and Cessnock was not released pending the King`s authority. The witnesses were themselves thrown into prison. records show them being transported to the Bass. in the Bass Rock prison. other prisoners shortly afterwards and died in Edinburgh in September 1686. The forfeiture was rescinded on 22 July 1690.